Old people…said it was really hard without the knife, a long time ago. So caribou ribs, one side is sharp, you know? They said they cut meat with that [before metal]. Athabascan hunting and fighting knives were originally made of bone or from native copper nuggets found in the Copper River valley. 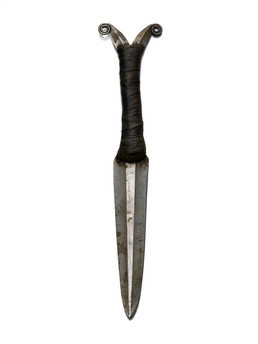 Later knives like this Ahtna example were shaped from iron obtained in trade. Every man carried a knife at his side in a beaded or quill-embroidered sheath. The blade of this knife is fluted and has a double spiral on the hilt; the handle is wrapped with tanned skin.